ATK TEAMS UP WITH HYOSUNG & H.D. "This contract signifies that the world's best motorcycle market has acknowledged the high technical skills, outstanding quality and the competitive price of S&T products," says Kim. White agrees about the level of quality and the fact that the price is right. "Dealers who have tested some of our first ATK/S&T motorcycles are very satisfied with the overall quality, and they are ready to be a part of this bit of history." White adds; "Our strategy is for ATK to be the second American brand in select Harley-Davidson dealerships. The prime focus of our initiative is to be a feeder brand to the V-Twin dealers — similar to what Scion has been to Toyota." White is quick to explain that The Harley- Davidson Motor Company does not endorse or support this joint venture in any way. White states; "Nevertheless, our new products fit the current Harley-Davidson dealer need and move to offer both the dealer, and more importantly, the retail customer, a complete staircase of V-twin based products, which only acts to complement the current Harley-Davidson product line-up." "The approach is simple; get new and younger riders to go into the Harley-Davidson dealerships," explains White. "We want to capture those customers who are initially looking for a smaller displacement motorcycle, at an affordable price, and then over time these new riders will develop the aspiration for a traditional Harley-Davidson." 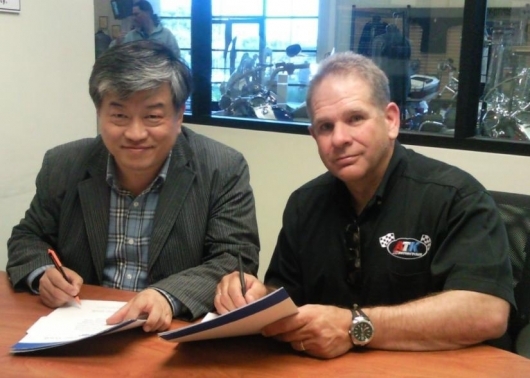 According to S&T CEO Taekwon Kim, this partnership is a win-win for ATK, S&T and for the dealers, saying, "We are happy to be a part of the „Confidence in America‟ moving forward and expanding what we see the conventional brands have brought to the marketplace." th at ATK headquarters in Centerville, Utah, more than 33,000 units will be brought to the American marketplace during the next four years. S&T Motors is the largest motorcycle manufacturer in Korea and is a publically traded company on the Korea Exchange (KRX) under identifier 000040. S&T has been manufacturing "Hyosung" branded motorcycles ranging from 250cc to 700cc, exporting to Asia, Australia, North & South America and Europe, totaling more than 60 countries worldwide and has a great reputation for making affordable, quality motorcycles. ATK is best known for its racing legacy. The first ATK conceived in 1985 won the legendary Barstow, CA to Las Vegas, NV Off-Road Motorcycle Race and since then has won multiple AMA National off-road and Dirt Track Championships. ATK is the second oldest continuously running US motorcycle manufacturer and currently is the only US based off-road motorcycle manufacturer. Over the past 25 years ATK has manufactured more than 15,000 Motorcycles / ATV‟ with a small staff of craftsmen in the Salt Lake City, Utah area. ATK has been a pioneer in innovation and technology advances, including being the first motorcycle company to introduce fuel injection technology beginning in 1991.